Home » Reports » Information Technology & Telecommunication » Europe Blockchain Market : Industry Analysis and Forecast (2017-2024) – by Provider, by Organization Size, by Application, by Industry Vertical, and by Geography. Europe Blockchain Market is expected to reach US$ 4.3 Bn by 2024 at a CAGR of 35.8%. Blockchain market based on application, provider, organization size, industry vertical and geography. Increase in the application of blockchain solutions across various industry verticals such as (BFSI), retail and eCommerce and real estate has helped in boosting the overall market demand. 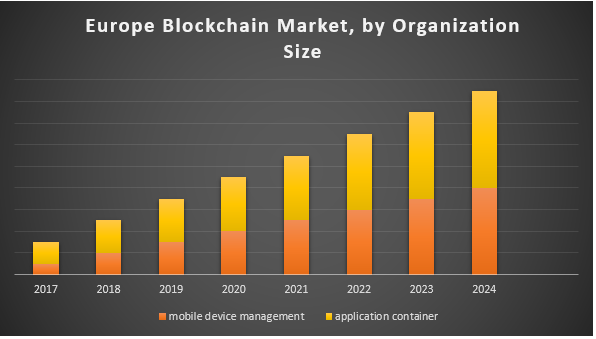 Europe Blockchain Market Infrastructure and protocols provider sub-segment had the largest market size among providers and is expected to dominate market during forecast period however it is application and solution provider segment that is projected to grow at a higher CAGR during the forecast period. Payments application sub-segment held the largest market share for 2016 with factors like increasing use in banking and financial transactions and growth of the digital identity market is expected to further boost demand for this market globally. Banking, Financial Services, and Insurance (BFSI) sub-segment is projected to have the largest shares during the forecast period, whereas it is the media and entertainment vertical that is projected to grow at the highest rate. Large enterprises held the maximum share while small and medium-sized enterprises (SMEs) accounted for the highest growth in this market. The reduced total cost of ownership, rising cryptocurrencies market cap, and initial coin offerings are few major drivers that have positively driven overall growth of the market. In addition to this, increasing demand for simplified business processes, transparency, immutability, faster transactions with reduced costs and increasing use of blockchain as a service also responsible for the growth of the Europe Blockchain Market. A rise in demand for fast processing applications for payments and transactions are few key factors boosting the overall growth. The increasing use of blockchain across smart contracts, document management and digital identities in the media industry are some main areas that is propelling the overall growth of the blockchain market. Highly cost-effective and time-efficiency form two key features for blockchain application as well in both large and small enterprises. In terms of geography, a market is sub-segmented into UK, Germany, France, the rest of Europe. Western Europe will be the second largest region at a worldwide level regarding blockchain spending. Increase in the application of blockchain solutions across various industry verticals such as (BFSI), retail and eCommerce and real estate has helped in boosting the overall market demand. Key player’s studies, analyzed, profiled and benchmarked in Europe Blockchain Market are Microsoft Corporation, IBM, Accenture, Deloitte, Capgemini, Cognizant, Infosys, Tata Communication Services, Virtusa Polaris, Wipro, 3 N-iX, Bitfury, Digital Asset Holdings, Eleks, IntellectSoft, LimeChain, R3.